I’m taking my photos a day ahead in the challenge at the moment, and as it’s election day here in the USA, I wanted to somehow commemorate November 6th 2012. Will is the only American citizen in our British born family and so I thought it would be perfect to include him in my image. He is a 5th grader, in his last year of elementary school, and today at school they held an election for the kids to help them experience and understand the ballot process. 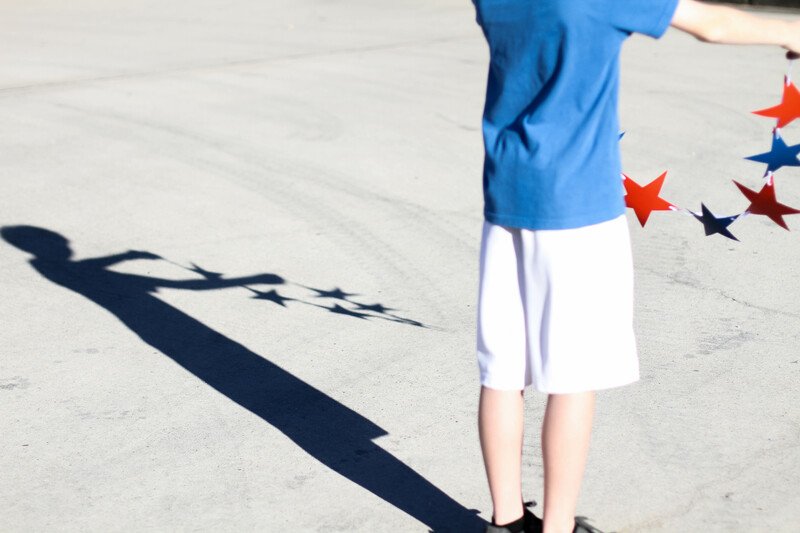 All the children were asked to dress in red, white, and blue, and so when he got home from school I grabbed him before he got inside, while the sun was still strong overhead, and gave him a banner of patriotic stars to experiment with in order to produce a cool shadow. After a few attempts, and battling the breeze, this is what we came up with. This is a “me and my shadow” moment caught in time. The sun was strong and bright when this picture was taken at around 3:30pm. I therefore set my ISO at 100 and my shutter speed was super fast at 1/3200. I knew that I wanted to focus in on the shadow, rather than Will, and so I deliberately set the aperture at f/2.0 so that he would be out of focus, and thus the shadow would be central to the image. In Lightroom 4, I wanted to enhance the shadow as much as possible, so I adjusted the shadows, blacks, and contrast. I also slightly increased the clarity, vibrance, and saturation, so the colors in the picture, most noticeably the stars, stood out. I cannot tell you how happy I was to be greeted by the sun today. It was perfect timing for the ‘shadow’ challenge. Being that it was election day, I really wanted to shoot something Presidential, so with the morning sun shining bright, I headed over to the Buffalo History Museum to photograph Lincoln the Emancipator, a bronze statue sitting on an engraved white marble base. The inscription on the base reads: “The gift of Julius E. Francis through the Lincoln Birthday Association, which he founded.” The statue is a replica of the statue located in Muskegon, Michigan by the same sculptor, Charles H. Niehaus. I arrived at the museum at the perfect time. It was 9:00 am and the sun was in a great position. In fact, the sun was glaring across Mirror Lake directly onto the statue. When editing the picture, the shadows caught by the camera never changed. The shadows up the first set of stairs and along the top of the building are very evident on the photo. 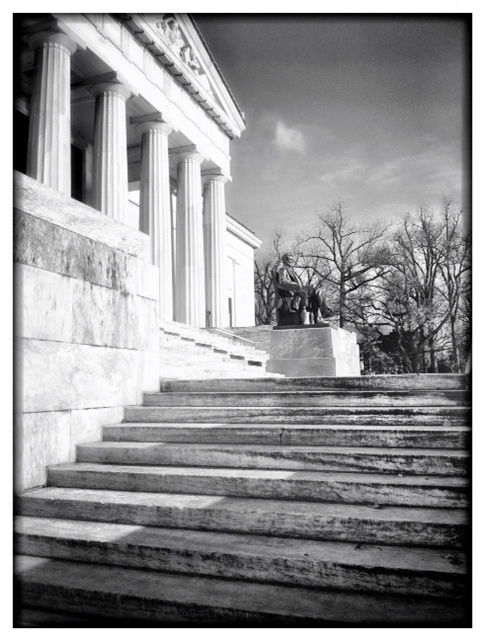 But, if you look closely behind the back of Lincoln, there is a shadow from the statue itself traveling up the stairs. The scene was simply breathtaking, especially after a week of overcast skies.